With polyoxyethylene-polyoxypropylene-polyoxyethylene (P123) as template, 1,3,5-trimethylbenzene (TMB) as swelling agent and tetramethoxysilane (TEOS) as silica source, mesocellular foam (MCF) with three dimensional (3D) cage-like mesopores linked by windows was successfully synthesized by hydrothermal method. N2 isothermal adsorption characterization indicated that the largest pore size was 17.3 nm, and the other structural parameters as window size, specific surface area and pore volume were 8.2 nm, 770.3 m2/g, 2.3 cm3/g, respectively. 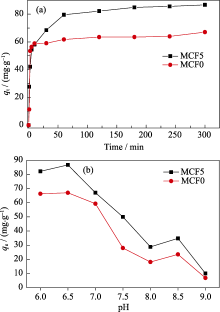 MCF was employed as carrier for adsorption of DhaA which is an enzyme for sulfur mustard decontamination. 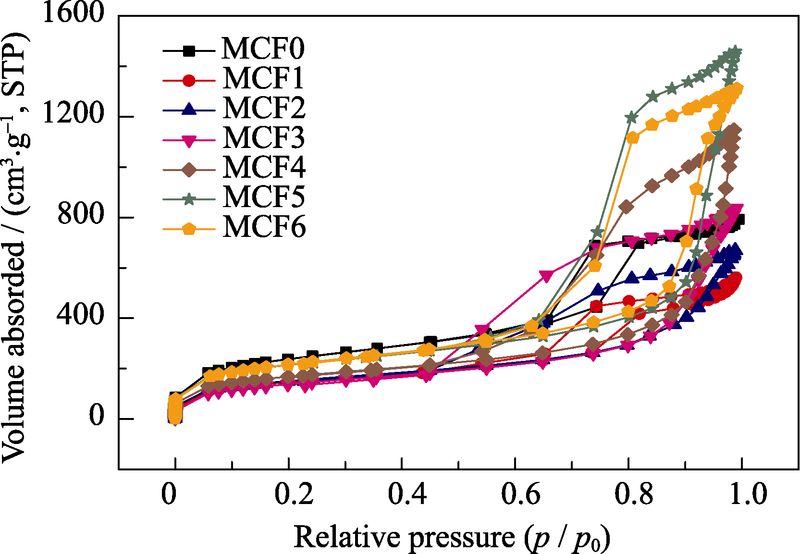 The effect of pH to saturated adsorption capacity of DhaA in MCF was studied and the results showed that the largest loading amount of DhaA was achieved at pH 6.5. 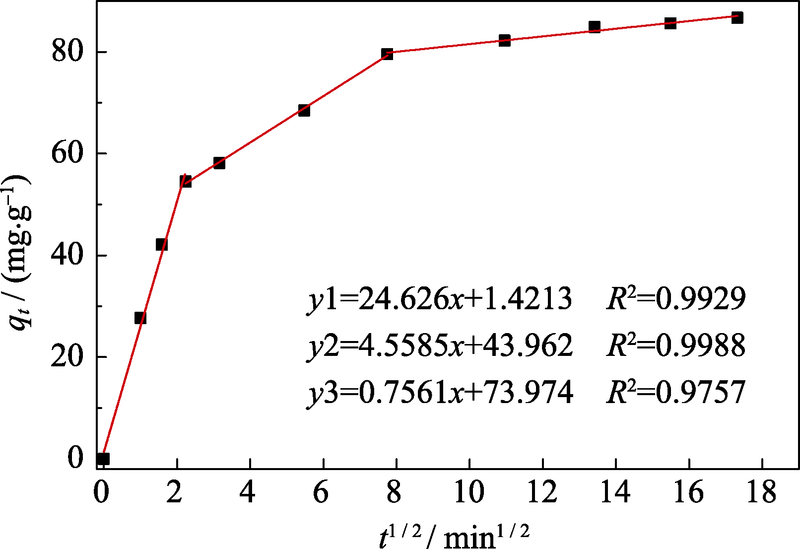 The adsorption kinetics followed Elovich kinetic model very well, and rate-determining step of this adsorption process was intraparticle diffusion. Adsorption isotherm curve of DhaA matched Sips model. The catalytic activity and conformation of DhaA changed obviously after being adsorbed in MCF. 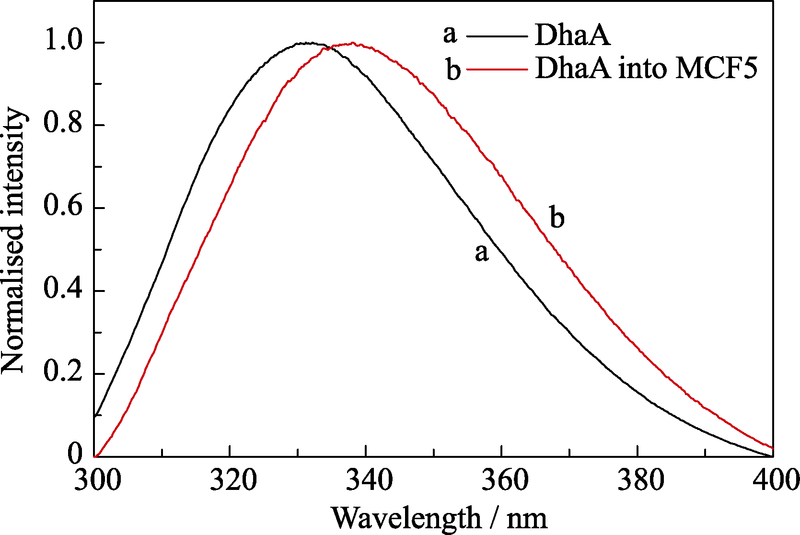 The residual activity of DhaA was 12.4% after being adsorbed, and the intrinsic fluorescence spectrum was found red shift. 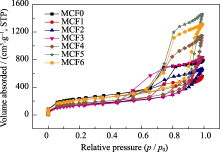 From the experimental results it can be observed that the big pore size, large specific surface area, and 3D cage-like structure of MCF facilitated the adsorption of DhaA, The electrostatic repulsion between DhaA and MCF influenced the adsorption process, and the conformation change of DhaA was the major factor of the decreased catalytic activity. 郑禾, 钟近艺, 刘景全, 张哲, 崔燕, 郑永超. 介孔泡沫对芥子气降解酶DhaA的吸附研究[J]. 无机材料学报, 2018, 33(11): 1201-1207. He ZHENG, Jin-Yi ZHONG, Jing-Quan LIU, Zhe ZHANG, Yan CUI, Yong-Chao ZHENG. 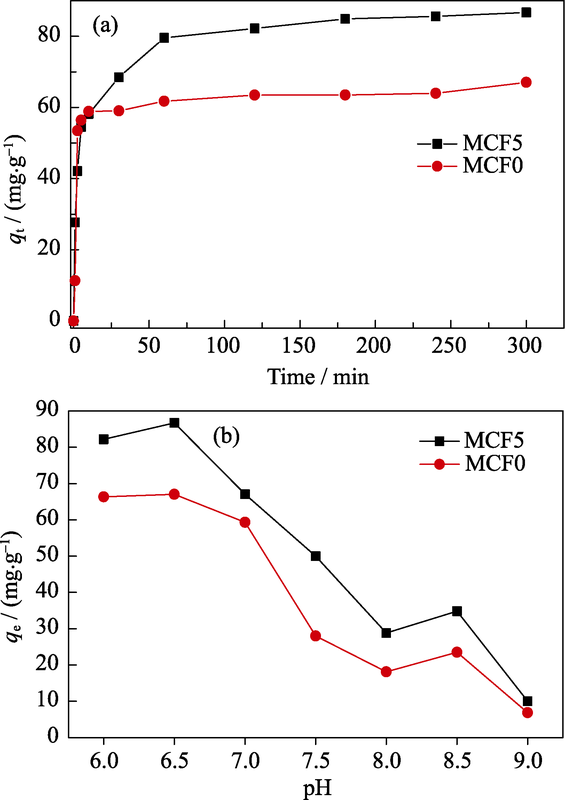 Adsorption of Enzyme for Sulfur Mustard Decontamination by Mesocellular Foam[J]. Journal of Inorganic Materials, 2018, 33(11): 1201-1207. GUO N, ZHAO Y Z, ZHONG J Y, et al.Efficient expression and fermentation conditions optimization of mustard gas hydrolase.Research Progress on Chemical Problems in Public Security, 2015, 273-280. GUO N, DONG L, LIU J Q, et al.Catalytic hydrolysis of sulfur mustard by haloalkane dehalogenases.Environmental Chemistry, 2015, 34(7): 1363-1370. ZHAO Y Z, ZHONG J Y, GUO N, et al.Improvement in the thermostability and activity of DhaA against sulfur mustard by multipoint mutagenesis.Chinese Journal of Applied and Environmental Biology, 2017, 23(4): 714-718. ZHAO Y Z, YU W L, ZHENG H, et al.PEGylation with the thiosuccinimido butylamine linker significantly increases the stability of haloalkane dehalogenase DhaA.Biotechnology Journal, 2017, 254: 25-33. NAGATA Y, OHTSUBO Y, TSUDA M.Properties and biotechnological applications of natural and engineered haloalkane dehalogenase.Applied Microbiology and Biotechnology, 2015, 99(23): 9865-9881. STEPANKOVA V, DAMBORSKY J, CHALOUPKOVA R.Organic co-solvents affect activity, stability and enantioselectivity of haloalkane dehalogenases.Biotechnology Journal, 2013, 8: 633-752. DIAZ J F, BULKUS K J.Enzyme immobilization in MCM-41 molecular sieve.Journal of Molecular Catalysis B: Enzymatic, 1996, 2(2/3): 115-126. TAKIMOTO A, SHIOMI T, INO K, et al.Encapsulation of cellulase with mesoporous silica (SBA-15).Microporous and Mesoporous Materials, 2008, 116(1): 601-606. VINU A, GOKULAKRISHNAN N, BALASUBRAMANIAN V V, et al.Three-dimensional ultralarge-pore Ia3d mesoporous silica with various pore diameters and their application in biomolecule immobilization.Chemistry-A European Journal, 2008, 14(36): 11529-11538. WEBER E, SIRIM D, SCHREIBER T, et al.Immobilization of P450 BM-3 monooxygenase on mesoporous molecular sieves with different pore diameters.Journal of Molecular Catalysis B: Enzymatic, 2010, 64(1/2): 29-37. AGUILA S, VAZQUEZ-DUHALT R, COVARRUBIAS C, et al.Enhancing oxidation activity and stability of iso-1-cytochrome c and chloroperoxidase by immobilization in nanostructured supports.Journal of Molecular Catalysis B: Enzymatic, 2011, 70(3/4): 81-87. WASHMON-KRIEL L, JIMENEZ V L, BALKUS K J.Cytochrome c immobilization into mesoporous molecular sieves.Journal of Molecular Catalysis B: Enzymatic, 2000, 10(5): 453-469. SERRA E, MAYORAL A, SAKAMOTO Y, et al.Immobilization of lipase in ordered mesoporous materials: effect of textural and structural parameters.Microporous and Mesoporous Materials, 2008, 114(1): 201-213. SCHMIDT-WINKEL P, LUKENS W W, ZHAO D Y, et al.Mesocellular siliceous foams with uniformly sized cell and windows.Journal of the American Chemical Society, 1999, 121(1): 254-255. IWASAKI I, UTSUMI S, HAGINO K, et al.A new spectrophotometric method for the determination of small amounts of chloride using the mercuric thiocyanate method.Bulletin of the Chemical Society of Japan, 1956, 29(8): 860-864. 赵渊中. 脱卤酶对芥子气的催化活性和稳定性研究. 北京: 防化研究院硕士学位论文, 2016. 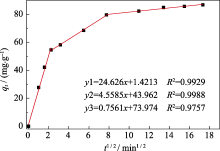 ROSENHOLM J M, CZURYSZKIEWICZ T, KLEITZ F, et al.On the nature of bronsted acidic groups on native and functionalized mesoporous siliceous SBA-15 as studied by benzylamine adsorption from solution.Langmuir, 2007, 23(8): 4315-4323. LAGERGREN S, SVENSKA B K. On the theory of so-called adsorption of materials. Swedish Academy of Science, 1898, 24: 1-13. HO Y S, MCKAY G.Pseudo-second order model for sorption processes.Process Biochemistry, 1999, 34(5): 451-465. AHARONI C, UNGARISH M.Kinetics of activated chemisorptions. Part I: The non-Elvichian part of the isotherm. Journal of Chemical Society Faraday Transactions, 1976, 72: 265-268. MARTINS A C, PEZOTI O, CAZRTTA A L, et al.Removal of tetracycline by NaOH-activated carbon produced from macadamia nut shells: kinetic and equilibrium studies.Chemical Engineering Journal, 2015, 260: 291-299. WEBER W J, MORRIS J.Kinetics of adsorption on carbon from solution.ASCE Sanitary Engineering Division Journal, 1963, 1(2): 1-2. FREUNDLICH H M F. Over the adsorption in solution.Journal of Physical Chemistry, 1906, 57: 385-471. TEMPKIN M I, PYZHEV V.Kinetics of ammonia synthesis on promoted iron catalyst.Acta Physico-Chimica USSR, 1940, 12: 327-356. 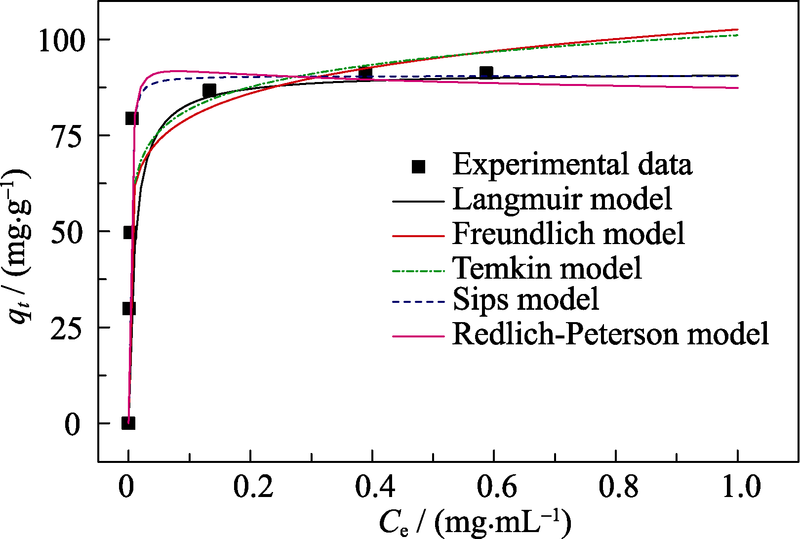 SIPS R.Combined form of Langmuir and Freundlich equations.Journal of Chemical Physics, 1948, 16: 490-495. REDLICH O, PETERSON D L.A useful adsorption isotherm.Journal of Physical Chemistry, 1959, 63(6): 1024-1026. FOO K Y, HAMEED B H.Insights into the modeling of adsorption isotherm systems.Chemical Engineering Journal, 2010, 156(1): 2-10. ZIVKOVIC L T I, ZIVKOVIC L S, BABIC B M, et al. Immobilization of Candida rugosa lipase by adsorption onto biosafe meso/ macroporous silica and zirconia.Biological Engineering Journal, 2015, 93: 73-83. DREIFKE M, FRIED D I, BRIELER F J, et al.Kinetic investigations of 6-phosphogluconate dehydrogenase confined in mesoporous silica.Journal of Molecular Catalysis B: Enzymatic, 2016, 132: 5-15. 陈孟秋, 王钰, 杨登尧, 邬红娟, 郭利民. 载铂多级孔ZSM-5分子筛用于邻二甲苯的“吸附-催化燃烧”循环脱除[J]. 无机材料学报, 2019, 34(2): 173-178. 隋丽丽, 王润, 赵丹, 申书昌, 孙立, 徐英明, 程晓丽, 霍丽华. 多级结构α-MoO3空心微球的构筑及其对有机染料的吸附性能[J]. 无机材料学报, 2019, 34(2): 193-200. 庞秋虎, 廖光福, 胡晓宇, 张全元, 徐祖顺. 多孔竹炭/二氧化钛纳米复合材料制备及其光催化作用[J]. 无机材料学报, 2019, 34(2): 219-224. 王祥学, 于淑君, 王祥科. 金属有机骨架材料在放射性核素去除中的研究[J]. 无机材料学报, 2019, 34(1): 17-26. 杜玉成, 王学凯, 侯瑞琴, 吴俊书, 张时豪, 祁超. 硅藻土原位生长Nb2O5纳米棒及表面Cr(VI)吸附转化行为研究[J]. 无机材料学报, 2018, 33(5): 557-564. 孙青, 祁琪, 张俭, 潘方珍, 盛嘉伟. 磁性ZnFe2O4/埃洛石复合材料的结构及吸附性能研究[J]. 无机材料学报, 2018, 33(4): 390-396. 代光, 肖欢, 郝文明, 马静红, 李瑞丰. 具有多级孔结构的丝光沸石的合成与性能研究[J]. 无机材料学报, 2018, 33(4): 397-402. 袁贝贝, 周蓓蓓, 章跃标, 施剑林. 具有尺寸和电荷选择性多功能分子吸附能力的电荷可转变型金属-有机框架材料[J]. 无机材料学报, 2018, 33(3): 352-356. 陈孟秋, 陈云, 舒杼, 王钰, 邬红娟, 郭利民. 埃洛石原料无模板法制备高比表面积介孔氧化硅及其在亚甲基蓝吸附中的应用[J]. 无机材料学报, 2018, 33(12): 1365-1370. AbubakerAbutartour, LotfiaElMajdoub, 史亚赛, 李妮丽, 徐庆红. 一种新型膦酸锆孔材料的合成及其对金属离子的吸附性质[J]. 无机材料学报, 2017, 32(3): 305-312. 魏建文, 林志峰, 何泽瑜, 和凯凯, 耿琳琳, 廖雷. 蔗渣活性炭二次活化制备及其吸附CO2性能研究[J]. 无机材料学报, 2017, 32(1): 18-24. 吕智慧, 洪天增, 乃学瑛, 董亚萍, 李武. 无水硫酸钙晶须的无机-有机表面改性机理研究[J]. 无机材料学报, 2017, 32(1): 81-85. 孙莉莉, 闫凯, 罗稳, 周健. 中空ZSM-5分子筛微球及其吸附与催化性能[J]. 无机材料学报, 2016, 31(8): 834-840. 李裕, 米琴, 薛泽慧. 磁性MCM-41分离回收RT培司废水中四甲基氢氧化铵的研究[J]. 无机材料学报, 2016, 31(7): 694-698. 王晓宁, 孟虎, 马付银, 李峥, 张岚. 制备方法对氧化石墨烯氧化程度及对Th(IV)、U(VI)吸附的影响[J]. 无机材料学报, 2016, 31(5): 454-460. 刘宇,王保峰,解晶莹,杨军,陈健. 二次锂电池中SEI膜的电化学性能表征[J]. 无机材料学报, 2003, 18(2): 307 -312 . 白凌云,苏显云,雷明凯. 络合作用对Sol-gel法制备Er3+掺杂TiO2粉末光致发光特性影响[J]. 无机材料学报, 2006, 21(5): 1085 -1091 . 牛晓滨,廖源,常超,余庆选,方容川. 热丝CVD生长SiCN薄膜的研究[J]. 无机材料学报, 2004, 19(2): 397 -403 . 孙洪巍,陈显求,高力明,封鉴秋,王淑玲. 组成对R2O-CaO-ZnO-Al2O3-SiO2系统分相的影响[J]. 无机材料学报, 2001, 16(3): 398 -404 . 吕东生,李伟善. LiMn2O4/LiPF6-(EC+DEC)溶液界面电化学研究[J]. 无机材料学报, 2004, 19(4): 801 -808 . 季金苟,冉均国,苟立,王方瑚,孙璐薇. 微波等离子体烧结多孔HA/β-TCP双相生物陶瓷的研究[J]. 无机材料学报, 2004, 19(4): 845 -851 . 王林军,方志军,张明龙,沈沪江,夏义本. 金刚石膜/氧化铝陶瓷复合材料的介电特性和热学性能研究[J]. 无机材料学报, 2004, 19(4): 902 -906 . 方雅珂,桑文斌,闵嘉华. TeO2晶体位错腐蚀形貌与晶体对称性[J]. 无机材料学报, 2004, 19(6): 1419 -1422 . 华绍春,王汉功,汪刘应,刘顾. 微弧等离子喷涂AT13纳米涂层的工艺优化[J]. 无机材料学报, 2007, 22(3): 560 -564 . 符史流,尹涛,柴飞. Ca2SnO4:Eu3+的固相反应形成机理及发光性质研究[J]. 无机材料学报, 2007, 22(4): 647 -651 .